Baudry Workshop of Art and Decoration, Paris. Martenot School of Plastic Arts and Art Education, Lyon. 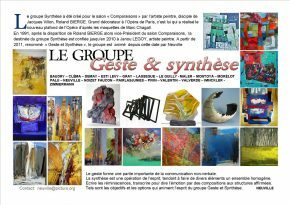 2004 / 2009: creation and animation of the Plastic Arts Workshop for adults and children at the Social Centre “La Condition des Soies”, Lyon. Since 2010 I accompany a research group in plastic arts at my workshop: Tuesday from 14 am to 16 pm and from 18 am to 20 pm. Information: see the inlet « contact ». The fascination with light effects. Design of stained-glass windows on demand, together with Joel Mône, master glazier in Lyon.